At the Chaffee Downtown gallery, the fourth annual “Full House” exhibition features five Vermont artists. The card game referenced by the show’s name is not one of strategy but of artistic choice; the Chaffee opens with a made hand of artists Peter Lundberg, Skip Martin, Joshua Rome, Brigitte Rutenberg and Claemar (Kleng) T. Walker. Four comfortable chairs surround a table near the back of the gallery; viewers might consider sitting down and taking the time to look. Rutenberg’s ink-on-vellum collages draw viewers in close. Described by the artist as “paper quilts,” her work is collage, quilt and picture in one. “Women have traditionally occupied themselves in their lives with detail,” Rutenberg says in her artist statement, “which led them to become ‘quilters’ by nature, putting small things together for the purpose of creating a larger one.” Her twofold process is intricate. Postage-stamp-size drawings — ink on tiny pieces of vellum — are partially attached to board, creating a layered texture. The drawings themselves consist of crosshatches, geometric designs, flowers, trees and miniature abstractions. Collaged together, they form a larger image. In Rutenberg’s largest collages, “Kimono” (36 by 24.5 inches) and “The Wedding Quilt” (35 by 27.5 inches), hundreds of drawings compose the images. “The Wedding Quilt” evokes the classic motif of interlocking rings, known to quilters as the Double Wedding Ring pattern. As a boy, Martin spent summers wandering the Ozarks, treasuring “the peace of wild places and the wonders that nature revealed,” he writes in an artist statement. “Photos captured those little happy times we can never relive.” Having inherited his father’s camera, Martin continues to share those intimate, fleeting moments in the natural world, connecting viewers to his experience and their own. “Winter Dust” (5 by 15 inches) revels in the beauty of geometry as displayed by a mountainous landscape. Mood and narrative elevate Joshua Rome’s woodblock prints, such as the 15-by-9-inch “Market Day,” a portrait of a man with a bundle on his back pushing an empty cart; or the dark, mesmerizing palette of “Moonlight on the Water” (33 by 10 inches). At the age of 21, Rome planned to study Japanese cabinetry, according to his biography, but an appreciation for color and paper in woodblock prints claimed his interest. So did Japan itself. Rome apprenticed with American-born, Japanese-style woodblock artist Clifton Karhu and lived for more than 20 years in the mountains outside Kyoto, documenting the lives of his fellow villagers using the traditional printing technique. Rome’s “End of the Road” (33 by 21 inches), with its retired, rusting machinery blanketed in snow, could be depicting an old Vermont hill farm rather than a rural Japanese one. In “One for the Ladies” (33 by 21 inches), Rome explores abstraction through outsize yellow leaves on a tree. For this exhibit, Claemar Walker uses coffee as her medium to create “watercolors” sans paint. Images of covered bridges and sap buckets hugging trees appear in monochrome, surrounded by dark frames. “I love the warm tones and sepia looks,” Walker explains in her statement. In “Good Old Days,” a full frontal view of an old pickup truck fills the frame. It’s impossible to know if the truck recently sputtered to a halt, or if it’s been stuck for years, but, either way, Walker’s powerful brushwork revs up the image. Peter Lundberg is internationally known for his large-scale, often site-specific sculptures. 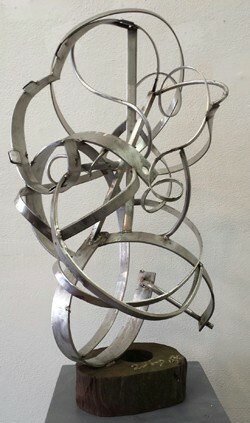 Space limitations at Chaffee Downtown presented a different opportunity: He has crafted small works in stainless steel and aluminum mounted on pedestals. Most consist of metal bands twisting and turning around one another, like multiple helixes spiraling out of control. Even up close, it’s impossible to understand how “Jambalaya” (30.5 by 17 by 13 inches) or “On the Right Track” (17.5 by 19 by 15 inches) manages to defy gravity in a glorious confusion. The satisfying journey of curves leads both nowhere and everywhere. Lundberg’s monumental sculptures made his reputation, but these works are lively and intimate. Getting up close to figure them out is half the fun; the other half is appreciating how much movement he can contain in a static sculpture. “Full House” may not have three of a kind and a pair, but this exhibition of five artists is a winning hand. The original print version of this article was headlined "Dealer's Choice"